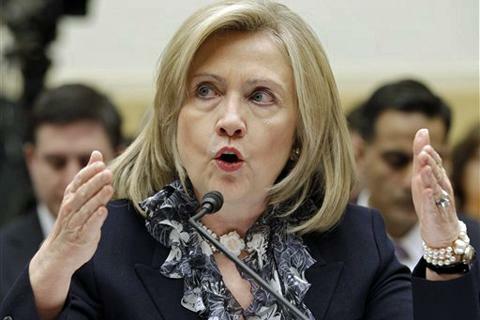 Yesterday Secretary of State Hillary Clinton testified in front of the House Foreign Affairs Committee to defend President Obama’s FY’12 budget request for the State Department and USAID. After opening statements from Chairman Ileana Ros-Lehtinen (R-FL), Ranking Member Howard Berman (D-CA) and Clinton, the committee immediately jumped to a marathon question and answer session—bringing the hearing to a near 4-hour mark. Most of the questions from Republicans and Democrats focused on the revolutions in the Middle East, particularly Libya. Secretary Clinton used this context as a jumping off point to make an eloquent defense of U.S. assistance and development programs and generally how the situation makes it even more important that we use every tool in our national security strategy to affect change. Stay tuned for more updates on Secretary Clinton’s tour of Capitol Hill.